The friction between the tires of your automobile and the road determine your maximum acceleration, and more importantly your minimum stopping distance. So the nature of that friction could actually be a matter of life and death. But like all applications of friction, it has frustrating ambiguities. Many years of research and practice have led to tread designs for automobile tires which offer good traction in a wide variety of conditions. The tread designs channel water away from the bearing surfaces on wet roads to combat the tendency to hydroplane - a condition which allows your car to "ski' on the road surface because you have a layer of water lubricant under all parts of your tire. Jones and Childers report coefficients of friction of about 0.7 for dry roads and 0.4 for wet roads. 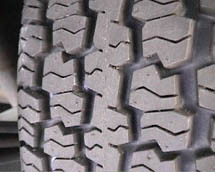 The tread design represents an "all weather" compromise. If you were an Indianapolis race driver, you would use "slick" racing tires with no tread. On dry surfaces you might get as high as 0.9 as a coefficient of friction, but driving them on wet roads would be dangerous since the wet road coefficient might be as low as 0.1 . Sooner or later, most people have to deal with the tricky judgment of how hard to put on the brakes in an emergency stop. It is a difficult issue, and no final answers are given here. But the illustration below may point out some of the relevant physical principles involved. In the best case scenario, you should keep your wheels rolling while braking because the bottom point of the tire is instantaneously at rest with respect to the roadway (not slipping), and if there is a significant difference between static and kinetic friction, you will get more braking force that way. But you generally don't have the luxury of time to make a delicate judgment about how hard to put on the brakes. For good tires on dry surfaces, there is not much difference between rolling and sliding friction, and if you back off the braking force very much, you will get less braking than if you just locked them down. The other issue is that in an extreme emergency, the braking is instinctive and you tend to hit the brakes as hard as you can before you can even think about it. Maybe locking the brakes is not so bad in good conditions on the dry road, and you may not be able to keep from doing so in an extreme emergency. But if you lock the wheels on a wet road, the results could be disastrous! I don't have anything like reliable estimates of the effective coefficient of friction, but I am guessing that it could easily drop to less than half of the "wheels rolling" braking because you are sliding on a surface which is lubricated by water. It may be that even with wheels rolling you might have in the neighborhood of 0.4 as a coefficient compared to 0.7 on the dry road, and it might drop down to the 0.1 of the slick tire. Those scary scenarios are depicted below in a qualitative way - I don't have reliable numbers. Jones & Childers, 2nd Ed.